Preview: Wake Forest was an afterthought in 2014 given their immense struggles on the offensive side of the ball. 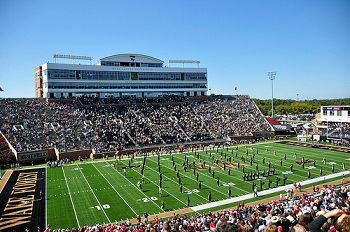 The Demon Deacons’ football program has fallen back off the map with 4 straight seasons in decline. It wasn’t a great opening year for new head coach Dave Clawson who’s trying to implement his system after showing success at his previous job coaching Bowling Green. The Deacons went just 3-9 overall in 2014 with their wins coming against Gardner-Webb, Army, and Virginia Tech. Wake Forest’s win against Virginia Tech was one of the more ridiculous games of the season finishing 6-3 in 2OT. Wake Forest had the worst offense in the nation in 2014 and it really wasn’t even close. It just goes to show how far a team can fall with freshman playing key roles at the QB position and along the O-line, while also implementing a new system. QB John Wolford had a trial by fire in 2014, but he showed improvement taking care of the ball in the second half of the year. Wolford will be pushed by Hinton and Kearns who’re also competing for the starting QB job. The O-line will be better this season with more continuity and depth, but it would be nearly impossible for this unit to regress. The backfield has question marks, but potential with a number of suitors ready to compete for the playing time. There’s still a lot of youth in the receiving corps and this unit will hope to get breakout years from guys like Harris, Hines, and Lewis. It’s pretty remarkable the kind of numbers the defense was able to put up in 2014 even with the offense putting them in terrible spots on a consistent basis. This unit isn’t likely to drop off and could even improve with 7 returning starters back in the mix. The defensive front seven will be one of the better units in the ACC. The D-line returns 3 starters and this unit will look to continue to get pressure while also getting better against the run. The Deacons have depth and talent at the LB position with all 3 starters coming back. Look for LBs Chubb and Lee to lead the defense again in 2015. The secondary is the one area of concern with both starting corners moving on and the unit will rely on unproven underclassmen at the backend. Prediction: Clawson showed he can bring success to a program like he did at Bowling Green and he’ll look to try and replicate this at Wake Forest. The team looked awful in 2014, but with the offense likely to make some gains this team can start building some success around their veteran defense. Wake Forest remains young and there’s still a long rebuilding process for this program to go through. A bowl game will be out of reach, but an uptick in the wins column is a realistic goal for this team in 2015.